Editor’s Note: Blog written by our fabulous intern, Caroline Ellis. When Snapchat was established almost four years ago, the premise was simple: correspond with friends via photos that last up to 10 seconds before they disappear. This type of technology has given social media a kind of impermanence discussed by Nathan Jurgenson in a post published on Snapchat’s blog. Snapchat introduced a concept known as “temporary social media.” Though a revolutionary approach, this idea also opened the doors for a more risqué use of the app, replacing the potential with an inappropriate stigma. In addition to the reputation Snapchat gained, there was that pesky little hack revealing that users’ photos were not deleted forever after 10 seconds, but instead these photos could be saved by friends unbeknownst to the users and uploaded online. No longer was the reputation simply hearsay, but now consumers were legitimately concerned. Snapchat had to act quickly and effectively to restore its image. Over the course of its four-year run, Snapchat has evolved from a “sexting” app to business and lifestyle tool. Snapchat has foregone any illusion that users are unable to capture images, now alerting consumers when a friend takes a screen shot of their photo. The My Story feature, added in October of 2013, allowed users to share clips from their days with their friends. Disappearing after 24 hours, the My Story feature invited creativity with a literal day-to-day look at someone’s life. My Story created an environment where celebrities could enter the Snapchat world and allow their fans to see a personal and informal side of their lives. Snapchat has become much more than a “selfie” app. In August of 2014 Snapchat launched Our Story— an expansion building off of the My Story foundation. This was the first time that users could see photos and videos from strangers around the world on their My Story feed. The premise of Our Story is to invite the collaboration of the Snapchat community in a particular part of the world to provide a glimpse into its daily life. Originally launched for the Electric Daisy Carnival, the feature allowed festival goers to upload their snaps for anyone to see. Snapchat’s next step was to expand to college campuses, establishing the application’s target demographic. As Snapchat continues to evolve, the question becomes how they can appeal to a more professional audience as opposed to “selfie-obsessed teenagers?” The answer came in January when Snapchat introduced Discover. This addition to Snapchat allowed corporations–including the likes of Yahoo!, People, National Geographic, CNN and ESPN–to create interactive daily stories. The debut of this new feature allows users to stay updated with the latest headlines, scores and fashion trends all in the same place. Of course the next factor in the equation is how small businesses can effectively use Snapchat. Perhaps it will come by way of the My Story feature with businesses using it to give clients a look into their everyday work lives. Maybe one day Our Story will showcase young professionals working in different cities around the world or will feature local businesses. The future for Snapchat and small business is unsure, but one thing is certain: Snapchat has proven that it knows no limits, and this limitless mindset is what keeps it exciting. 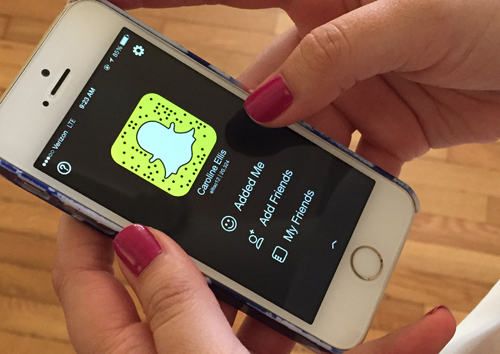 Would you consider Snapchat as part of your marketing plan?